Previously, I have informed you that a new color will be released in non-marking type A-class on this NEWS site. Yesterday, A-Class product samples arrived. The photos may look slightly different from the real on the monitor, but we will show you the latest information. I think that arrival will be around August. With this addition of sand color we will release 12 kinds of Japanese 20 ” tires and 3 Taiwan made tires for 2018. *All made below made in Japan 110psi and Sand color products are limited production. High popularity, ARES INNER TUBE all sold out. Only the size of 1.85 – 2.125 may be prepared a little earlier. 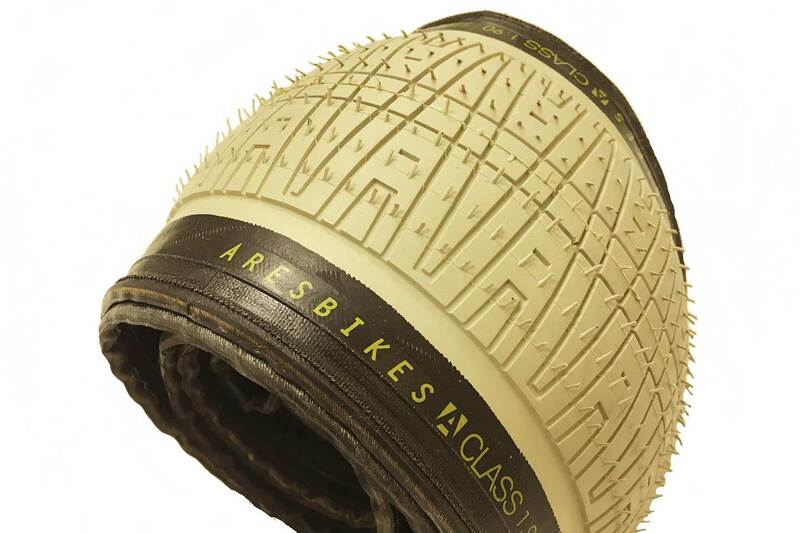 This ARES INNER TUBE also made by IRC. What is the difference between Silica and Carbon compound? The difference between the characteristics of Silica and Carbon is that grip force does not change due to temperature change. Also, do not pollute the floor. As a property of silica, rolling resistance decreases at high temperature, and grip is good even at low temperature. I thought that I heard this, but the car’s studless tire seems to be almost silica. Silica is softer than carbon and has a modulus (tensile stress) because it is in the form of a plate, and it seems that it expands more than a tire containing carbon.